Somerset is a stunning place to get married with its open countryside, historic buildings and its proximity to the coastlines to both the north and south. Somerset is probably most famous for being the home of Glastonbury Festival. Its apple orchards and resulting cider production, and being the birthplace of cheddar cheese are also claims to fame for the county. Somerset is easily accessible from all directions, bordering Gloucestershire and Bristol to the north, Wiltshire to the east, Dorset to the south-east and Devon to the south-west. Its good transport links make it the ideal location for a country wedding regardless of where you’re from. There’s a fantastic choice of wedding venues in Somerset, from historic country houses to quirky outdoor wedding venues. Choosing the right Somerset wedding venue for you comes down to the style of wedding you’d like and, of course, your budget. A village hall makes a good blank canvas wedding venue for couples looking for an intimate budget wedding venue in Somerset. The size, capacity, style and cost varies, with some village halls offering a flat rate and others an hourly hire rate. For those for hire at an hourly rate, bear in mind you’ll need to include set up and pack down time in your hire. Because village halls tend to be plain in decor and all furniture will need to be set up and tables laid, many couples prefer to set up the day before. Village halls tend to have built-in kitchen equipment and toilets, and some have stages and sound equipment. It’s important to check what facilities are available and let your caterer and other suppliers know. Sometimes caterers will need you to hire extra kitchen equipment, you might need to find suitable tables and chairs, and you will usually need to hire in crockery, cutlery and glassware. Somerset is a great location to host a wedding in a marquee with its open countryside and generally mild summer weather. If you have a large garden, a marquee wedding is a lovely idea to keep your special day personal to you. If you don’t have the space, some farmers will hire their land and will often allow you to camp overnight, though bear in mind this might not always be a cheap option because of the preparation involved. You will need to hire everything from a catering tent and kitchen equipment to tables, chairs, carpets and lighting for a marquee wedding. This means you can style your wedding exactly the way you want it, but does mean costs can creep up. Many marquee hire companies offer packages that include furniture and equipment – these usually work out more cost-effective than trying to source everything yourselves. Also consider back up plans for wet and/or cold weather – marquees aren’t insulated so heating may be required, even in the summer. Wedding barns can offer a similar wedding style and cost to a marquee wedding but, as permanent structures, usually come with the added bonus of being furnished and insulated. 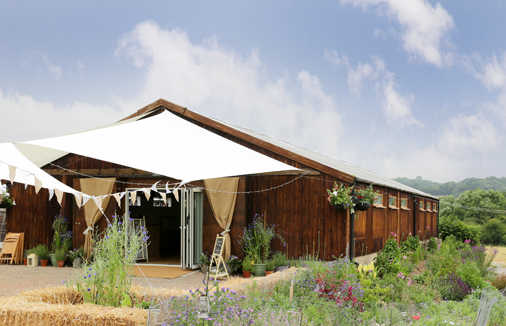 With the abundance of farms in the south west, there’s a few barn wedding venues in Somerset and surrounding counties. What’s included – and the price – varies hugely. Some wedding barns offer couples the chance to DIY their whole wedding by allowing you to pick your own caterers and other suppliers. Others have their own catering company that you must use. Like all permanent wedding venues, most weddings barns are licensed by their local authority and subject to business rates and regulations. Many do allow you to provide your own wine and toast drinks, but some charge corkage for this. It’s important to check what is included and what restrictions the venue has. A country house wedding in Somerset is ideal for people looking to just turn up and enjoy their big day with no hassle. They will usually have a dedicated wedding planner who’ll coordinate everything from decorations to flowers. Country houses often work out to be the higher budget option. But, as many houses are hotels as well, they will often offer their guest rooms at a reduced price. Everything, from decor to the wine list will often be taken care of. This leaves you to just enjoy the day, but isn’t ideal for those looking to put their own stamp on their wedding. If a country house sounds like your idea of a dream wedding, be sure to check what is included and what restrictions there are. Often hotels charge a small room hire fee on top of their in house catering. There are sometimes minimum numbers and many will not allow you to supply your own wine (or charge a higher corkage rate than the actual cost of the wine you’ve chosen!). If the venue is a hotel, check what exclusivity they’ll offer you to ensure you don’t end up celebrating your big day with other hotel guests. Things to consider: check with the venue what’s included, what extra compulsory charges there are and what restrictions they have.